I love books. I love fitness. a+b=c, I love books about health and fitness! As a result, when I saw John "Bones" Rodríguez's Half-assed Health for review on tomoson, I jumped right on it! See the "how to look good naked" sticky note on the cover? That kind of becomes his catch phrase, and unfortunately it gets inserted in random places that left me feeling disjointed and a little uncomfortable. The author prescribes to going to the gym at least three times a week, he runs (which he calls half-assed because it's a full-body workout, so he doesn't have to do focused exercises), and he talks about protein shakes (while promoting his own brand of the stuff)- I dunno about you, but that doesn't sound "half-assed" to me. I wish he either wrote this as his personal journey to healthy living or included some more authoritative voices. As it is, he's trading on his healthy physique, despite the fact that health means something different for anyone. All in all, I really enjoyed reading this e-book. Despite the cons list, it's the pros that really stayed with me as I approached this review. It felt like chatting with a hilarious friend about working out and eating well- I work at our campus gym and some of my friends are health coaches so this isn't an unusual occurrence! It was almost like this friend was worried about my state of being during midterms and was jokingly cajoling me into getting back on the bicycle in baby steps (I'm probably mixing my metaphors, but you get the idea!). 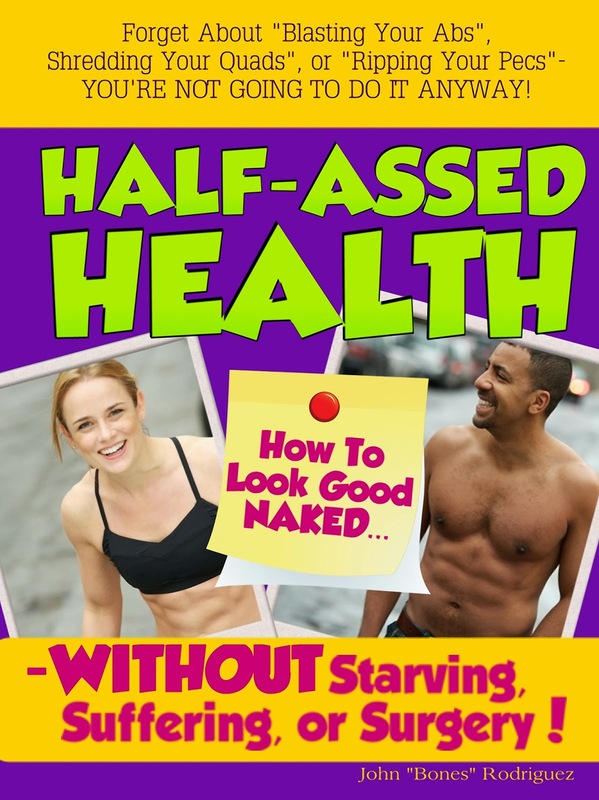 While I don't recommend making Half-assed Health your fitness bible, I would recommend it as a kick-in-the-pants reminder that health should be worked into your every day life. Enter to win a copy below so we can discuss!